Sony Alpha users have been a bit of the step-child amongst the wireless flash users out there. 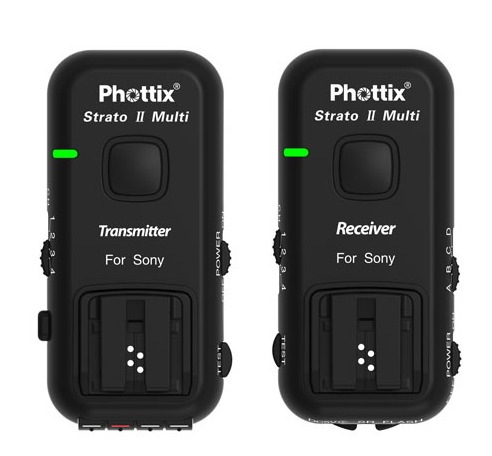 Fortunately, Phottix has released its Strato II wireless triggers for the Sony flash mount. Phottix claims ranges of 150+ meters. The transmitter includes a hotshoe on top for pass-through to an on-camera flash as well. While I haven’t used these, I have heard good things about Phottix’s triggers for Canon’s TTL system from Chris at the Phoblographer. A transmitter and receiver pair for the Sony Alpha system costs only $98 and additional receivers are $57 each. Details on Phottix’s website. PLEASE NOTE: Strato Multi receivers are designed to work in Manual Exposure mode and have no TTL functions.